The 17th Annual Afternoon in the Country—Atlanta's most delicious fundraiser—is this Sunday, November 5, 2017, at Foxhall Resort & Sporting Club! Your hosts are the 125 members of Les Dames d'Escoffier International-Atlanta Chapter, a non-profit organization of professional, magnificent women who are restaurateurs, chefs, caterers, public relations executives, event planners, fundraisers, culinary teachers, nutritionists, wine industry executives, hotel executives, retailers, and farmers! I've had the great honor of knowing members of Les Dames for nearly seven years and then I had the pleasure of working with all of them—as their Chapter Photographer—starting with a celebration of Julia Child's 100th birthday and for 4.5 years following that occasion. I'm eternally grateful for that experience and will always be an uber-fan and supporter of Les Dames. This year will be my 5th Afternoon in the Country (AITC)! The photos I'm sharing in this post are from the last four years of Afternoon in the Country events and show some of the delicious fun you too can savor this Sunday! Afternoon in the Country boasts celebrated chefs from many of Atlanta's top restaurants and fine beverages, too, all set up under festive big-top tents (it's a rain or shine event) on the pristine polo lawns at Foxhall, where another time you might enjoy horseback riding or any number of other adventures! The weather forecast for this Sunday is for a perfect partly-sunny 75° day! This highly anticipated event has grown from 200 attendees in 2000 to more than an expected 2,000 in 2017! Who are they? They're some of the region's most discerning food and wine and event goers, who are there not only to enjoy amazing food and delicious wines (and local beers and spirits), they're also there to support the philanthropic mission of Les Dames and its beneficiaries...and of course a great time with fellow enthusiasts. 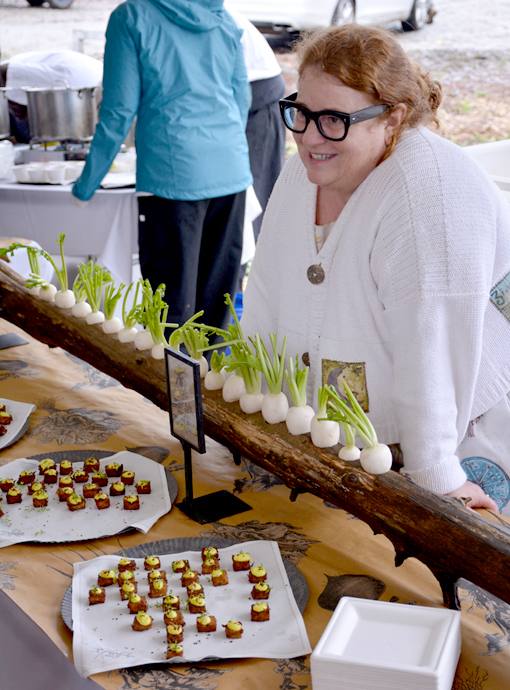 Among this year's 120+ stations, attendees will enjoy bites from The General Muir, Chai Pani, South Main Kitchen, The Optimist, O-Ku, Sweet Grass Dairy, The Woodsman & Wife, and Wrecking Barn Farm, and many other notable Atlanta dining destinations. I can tell you from personal experience that this event is a brilliant way to expand your list of special occasion and regularly visited restaurants. Many times I've gone to a restaurant that I first tasted at Afternoon in the Country and was as delighted in-restaurant as I was at the Les Dames event. Taste your way to a litany of new culinary experiences in Atlanta! Proceeds from Afternoon in the Country benefit LDEI-Atlanta Chapter's scholarship and grant programs which support the dreams of Georgia women in the culinary, beverage, and hospitality arts. Les Dames/Atlanta raised and awarded $107,242 last year for those programs! That's incredibly impressive for an all-volunteer organization and I've had the awesome pleasure of hearing first-hand from many of the recipients the impact those scholarships and grants made in their lives. Quite moving. The money you contribute via your event ticket purchase, silent auction win, and cake raffle tickets really and truly do go to a great cause! Afternoon in the Country's Cake Raffle is indeed famous! These amazing creations, made by master pasty chefs, range from cakes that will remind you of the one's your mother made for birthdays and Sunday Dinner dessert to incredibly elaborate, complex, show-stopping masterpieces! The rules for the Cake Raffle in the past have included a "must be present to win" stipulation—because the ecstatic winners get to take home their cakes that day! At least, those who don't eat them on the spot, that is. Yes, while totally salivating, I've seen that! There's an extensive silent auction, too! Bid, bid, bid on the fabulous auction items ranging from wine baskets to original art to luxury cookwares to travel packages. There's something for every foodie, and then some! I'm sure you've heard of some of the members of Les Dames, including Grande Dames Julia Child and M.F.K. Fisher. Dale DeSena, founder, Taste of Atlanta. If you're an Atlanta foodie, you're going to see familiar faces, either hosting, cooking, pouring, presenting scholarships, or selling tickets for the famous Cake Raffle! 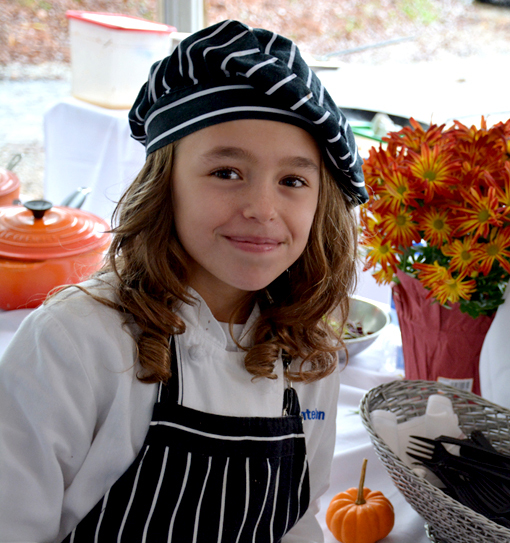 Although this is a grown-ups event, you'll likely see some young chefs, too! A regular at Afternoon in the Country, the daughter-of-a-chef young lady pictured above is perhaps the most photographed "chef" at the event. She totally gets the PR factor famous chefs around the world demonstrate. I've long been impressed, again and again, by how approachable Atlanta chefs are, beginning and well-seasoned alike. I'm proud to call many of them friends. The live music is phenomenal! Afternoon in the Country veteran Theresa Hightower and her Jazz Band are returning for this year's event! Theresa is regarded as one of the great jazz and blues vocalists, actresses, and songwriters of her generation, and she's an AITC attendee favorite! Toward the end of the event there are official photos made of all attending Dames and another of all participating chefs. It's one of the most concentrated powerhouses of culinary talent you'll ever see in Atlanta! Last year, as I'm sure she will this year, Theresa Hightower had this unlikely "chorus" singing like their karaoke prize was Executive Chef of the World! They enjoy the chef camaraderie as much as attendees enjoy everything the chefs prepare. Both fantastic to experience! There's but a tiny glimpse into the fun awaiting you. Get your tickets to Afternoon in the Country and join me and 2,000 others this Sunday for Atlanta's most delicious fundraiser!